All winter long my chickens have been trying my patience with their sleeping in the nest box antics. I do mean all winter long! Of course you never want chickens to sleep in the nest boxes because then they poop in the nest boxes. Poop in the nest boxes gets on the eggs which is sorta well, gross. We want to collect clean eggs every day, not dirty ones! Sleeping in the nest boxes is completely different then a broody setting on eggs in a nest box because a broody doesn't poop. A sleeping chicken does poop. Yes, I know that's weird but some things chickens do really are quite weird! I have had to deal with this problem in the past and I have several different methods that usually work. The problem this time was the placement, mounting and type of nest box made it difficult to use any of those other methods in this situation. I finally decided to put an end to this nest box sleeping thing and out of desperation I took all the nest boxes out of the coop! Now they have to sleep on the roosts, but that's just the beginning. I started by taking all the nest boxes out, washing them and leaving them outside for a few days. It was the dead of winter and I only had my 2 youngest girls laying regularly anyway. They ended up going behind a board I leave in that coop for the guineas and laying their eggs back there. The chickens all started sleeping on the roosts again so I added a nest box back. We went a few days without anyone sleeping in that nest box so I added a second. Finally I added the last 2 nest boxes back in and that's when I discovered that I am a complete idiot sometimes. The perch on the front of the plastic nest boxes I had bought, is made to fold up to block access to the nest boxes. It's ok, you can laugh....I did! 1) Block access to the nest boxes. 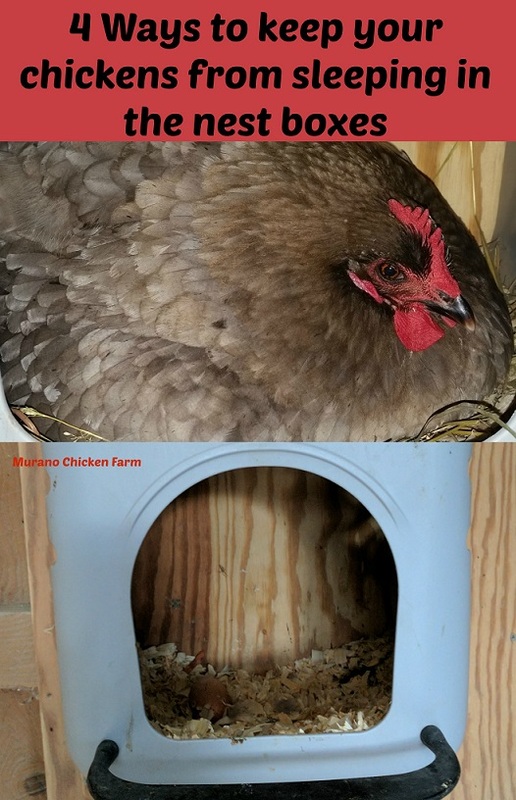 When I had wooden nest boxes I just placed a board across the front of them after about 3pm so the chickens couldn't get in to the nest box to sleep. 2) Remove the nest boxes from the coop. (as mentioned above!) The silkies have plastic nest boxes sitting on the floor of their coop. I just pick the nest boxes up and put them in the run in the evening. Occasionally I would find a hen had decided to sleep out there so I simply picked her up and put her on the roost at lock up. 3) Add a new roost higher up then the highest nest box. They love to be up high and unfortunately if the nest box is higher then the roosts they'll choose to sleep there. 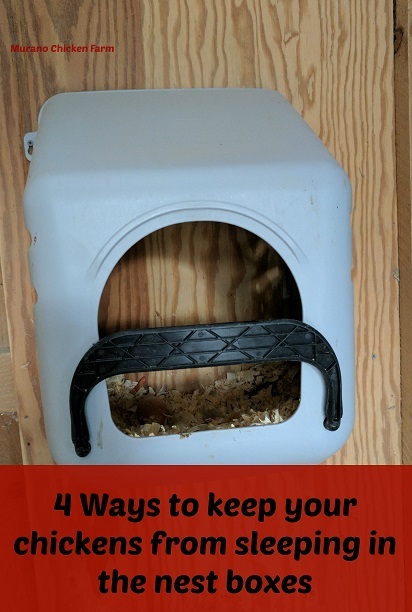 Always make sure the roosts are higher than the nest boxes and that there is enough room for all the chickens to roost at once. 4) As a last resort I've picked each hen up at night and put her on the roost. This works best if done in the dark. I use a headlamp that has a red light option and it seems to help since it's not super bright. Related reading: Countryside Daily has a cute article on 10 Different types of nest boxes. I appreciate the great information! We have two dominickers who are determined to sleep in the boxes! We have 30 laying hens total, so we've never been sure why these two are so daft. Now that you said this I'm thinking...I wonder if it has something to do with the pecking order? It seems that only a few of mine do it too. Odd. We have had an issue with our Silkie bantam hanging out too much around the nesting boxes. Our are built in and open, so at first she was just roosting on it at night and pooping in one of the boxes. Ugh. Now she's, like, semi-broody, if that's a thing, and I think she's just laying on the eggs after like 3pm. We would let her be broody, but she runs around for part of the day! I don't know. My first experience with this. lol Thanks for sharing your tips on the Homestead Blog Hop! These are good tips that I wouldn't have thought to do, thanks. Even though I only keep a few hens, I want them to be happy egg layers. I came to visit you from the Homesteader Hop; I invite you to stop by 4Shoes Life anytime.